How to Choose the Perfect Cabinet Hardware Size | Arthur Harris & Co.
Posted March 6, 2017 by Arthur Harris & filed under Company News. 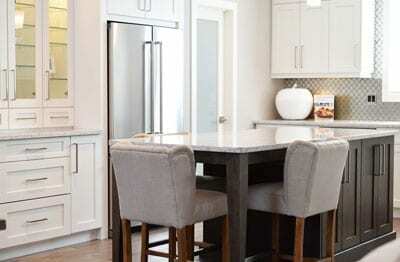 Remodeling and customizing your kitchen can be a big project. After planning and designing on the large scale it might be tempting to coast through choosing the cabinet hardware, but high-traffic rooms such as kitchens deserve detailed attention. Choosing the right hardware size requires a balance of style and function. Sacrifice one for the other, and you probably won’t be happy. You’ll be frustrated every time you try to pull open a drawer, or you’ll be disappointed every time you walk into the room. Don’t fret; finding the perfect cabinet hardware to integrate into your kitchen style can be easy with a little direction. Follow the 5 steps below to learn how to choose cabinet hardware size and you’ll be well on your way to the perfect cabinet accessories! By the time you are at the point of choosing your cabinet hardware, more often than not you have determined your kitchen design style. In determining what type of hardware you want, make sure it will compliment your overall kitchen design theme. 2. Hardware types: Knobs, pulls or both? Each option has its own benefits and will give you a unique look. Knobs only: The benefit of cabinet knobs is that they are typically less expensive than bar and T-pulls, and they only require one hole to be drilled into your cabinetry. A single cabinet knob can be installed on cabinet doors, but you may want to consider placing two knobs on larger drawers. Cabinet drawers are heavier than doors, therefore you may need that extra knob for ease of use. The minimalistic style of using knobs only for your cabinetry can give a very appealing look to your new kitchen. Pulls only: Cabinets that only feature pulls tend to present a more modern look. Stainless steel bar pulls tend to be more functional on heavy drawers, and are ideal for aging hands that have limited flexibility and strength. Pulls and Knobs: It is most common to have both pulls and knobs featured in the kitchen. Knobs are most typically placed on doors, and pulls are placed on drawers. Each kitchen is unique to the owner, and you should mix and match to best meet your own style. For white or light cabinet colors, use a darker hardware finish with less lustre, like brushed stainless steel. For darker cabinet colors, consider a lighter hardware finish such as mirror stainless steel. Keep in mind it is common for cabinet hardware to match or complement hinges as well as faucets or other appliances in the design space. For oversized cabinetry (dimensions of 36″ or larger) such as drawers for built in appliances you may want to consider longer length pulls (6”, 8”, 10” or 12” center to center) or oversized knobs (diameter of 1-1/2” or larger). For standard size cabinetry (dimensions of 12″ – 36″) the most common pull sizes are 3”, 4”, 96mm, and 128mm center to center (from one screw hole to another). Standard knob sizes are 1 1/4″ or 1 3/8″. For small specialized cabinetry (narrow drawers or dimensions under 12″) like built-in spice racks, use smaller knobs under 1″ in diameter or T-pulls rather than bar pulls. At this point, you will have narrowed down your hardware choices to a specific style, type, size and finish. Next thing to incorporate is your budget. A good starting point is to count how many knobs and pulls you will need for your cabinetry and determine a price range that is comfortable for you. Many hardware manufacturers have multiple lines of varying quality and price, so be sure to find a manufacturer that uses high-quality materials. Buying cheap can seem like a good idea in the short run, but cheaper metals will degrade faster down the road and face a much higher risk of breaking or bending. Stainless steel hardware, for example, should be solid (not hollow) with a durable but even finish. Although the choices are many and may be overwhelming at first, a little planning and organization will help you find the perfect hardware to match your kitchen and personal style. By following these guidelines for finding the perfect cabinet hardware size, your dream kitchen is that much closer to becoming a reality!